How are the essays to be essayed? How is the reader’s interest to be excited? How are the incidents to be kept cohesively as organisms? How is the reader made to feel lapse of time without being pestered by time? The answer to all these questions is Santosh Bakaya and her book of essays “Flights from my Terrace”. When we enter Flights through the voice of Santosh Bakaya, we visualise her manner of telling firmly rests on a technique of reminiscence and recall of the past, without a strong ordering sense of time. Unobtrusive yet pervasive, the essays would lack their dramatic qualities of immediacy and change, if these are not handled deftly, and the essayist in Flights, by her subjective personal attachment to all the incidents, events and memories has succeeded in nailing it, and nailing it beautifully. The reader is coaxed into taking the position of an interpreting spectator by the presentation of thought in the essays. The essays are so powerfully written that they keep before the reader emblems of the situations he has been in somewhere in his life, and like that Chinese, who while watching “Hamlet” in the theatre, cries “I am a Hamlet”, the reader of the Flights cries that he is the boy of “The Kite Flying”, Beggar of “The Power of Cricket” and so on. By employing the way of writing of A G Gardiner, Santosh Bakaya brings it home to the reader that essays do not necessarily have to be prosaic and merely informative, like those of Beacon or swift, but they can also be lyrically poetical. The book containing fifty eight essays in total, has been divided into three sections- the first section comprising the essays talking about the recollections of the author’s childhood brewing with nostalgia, the second section expatiates on the friendly encounters of the author, and the third one, constituting most of the essays, though shorter in length than those in section one and two, revolve round the general subjects. The essays are an odyssey of childhood memories, nostalgia, and internal journey mirroring universal human feelings. All the memories of the surreal encounters in childhood are fraught with sensitive emotions of delight, loss, wonder, and bewilderment. It is true that memories do weave the warp and weft of these essays as the essay, ‘The Persistence of Memory’ mentions of “…a chunk of memory here, a sliver of memory there”, but it will be premature and fallacy to aver that these are the photographic representation of the author’s memory. One is flabbergasted as to with what deftness and delicacy, the memories, sprawling deep in the subconscious of the author and popping up their heads at times, are soothing as well as agonising at times, scary as well as exhilarating at times. 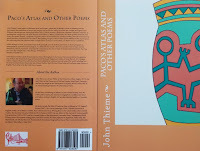 The author’s memories about her father do flash the picture of a towering personality and his love and care for his daughter in the inward eye of the reader as well by travelling along with the author on the wings of her imaginative flights to her nostalgiac past. The lines, “Yes it was cold without dad’s warm presence. That is why I had come looking for him in the blissful past” speak volumes of the attachment of the essayist with her father. The beauty of the essays lies in the exaltation of the mediocre and the commonplace like the neem tree, family pets, the family dog, Nipper, and the cat, Lazy and scads of other ordinary things and incidents of everyday life, to which human heed is seldom riveted. The power of essays lies in the immensely captivating pull of the narratives where the reader, oblivious of the world, falls to the ‘alienation effect’ and identifies himself with that shabby beggar, feels his ubiquity around, sways away with his craze for cricket. Another ravishing essence of the essays is that they uphold a world all-pervading a perfect harmony in Nature where the human world and the world of animals overlap so peacefully that both the worlds seem singing in chorus the hymns of Oneness in All. Umpteen animals, gardens, clouds, flowers, birds, and other manifestations of Nature are dovetailed in the essays with a peaceful and blissful way. Coming to the diction and language, Santosh Bakaya because of her wide spectrum of knowledge by reading the classic as well as the modern literature, seems very much influenced by way of writing employed by Elizabethan, Neo-classical, Romantic, Victorian and Modern literary giants. That is why she seemingly rebels against the diction in vogue. Her writing is peppered by Victorian as well as the Romantic smack. Besides, there is always musicality and symphony vivid in her writings. The line “I stumbled and tumbled, grumbled and mumbled, fumbled and then almost crumbled on the staircase” is a testimony to her love with rhythm and symphony that her heart wishes to feel in the world as well. 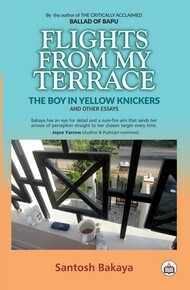 To sum up, it can be cogently said that “Flights from my Terrace” is such a precious treasure added to the Indian English Literature that it will always be a pleasure to the reader to have his hands on it and cherish its reading again and again.